Increased serum levels of procalcitonin (ProCT) and its componentpeptides have been reported in humans with sepsis. Using a hamster model ofbacterial peritonitis, we investigated whether serum ProCT levels are elevatedand correlate with mortality and hypocalcemia. Incremental increases in doses of bacteria resulted inproportional increases in 72h mortality rates (0, 20, 70, and 100%) as well asincreases in serum total immunoreactive calcitonin (iCT) levels at 12 h (250,380, 1960, and 4020 pg/ml, respectively, vs control levels of 21 pg/ml).Gel filtration studies revealed that ProCT was the predominant (> 90%)molecular form of serum iCT secreted. In the metabolic experiments, total iCTpeaked at 12 h concurrent with the maximal decrease in serum calcium. In this animal model, hyper-procalcitoninemia was an earlysystemic marker of sepsis which correlated closely with mortality and had aninverse correlation with serum calcium levels. There are approximately 400000 cases of sepsis reported each year in the USA, leading to about 100000 deaths annually [1,2,3]. Indeed, mortality from sepsis in most series is reported to be between 25 and 40%, with Gram-negative bacteria being the most commonly encountered pathogens [3,4,5]. The severity of sepsis may distinguish those who may benefit from therapeutic blockade of their excessive and maladaptive immune response, from those who may not. Consequently, a practical way to determine the presence and severity of sepsis is essential. Although systems of evaluation based on clinical observations and physiologic parameters are helpful, they have been of limited use for predicting morbidity and mortality in individuals with inflammatory conditions, especially in surgical populations [6,7,8,9,10]. An early indicator of tissue injury should improve the predictive capability of these systems. Although several cytokines have been proposed as markers of disease severity, they are often transiently elevated, or detected only in local pools . In this regard, recent studies in humans have revealed that the prohormone of calcitonin (CT), procalcitonin (ProCT), as well as its component peptides offer promise of being early and useful predictive markers of systemic inflammation [11,12,13]. CT is a neuroendocrine (NE) peptide that was once thought to be exclusively a hormone of thyroid origin. Its principal function appears to be the conservation of body calcium stores in certain physiologic states such as growth, pregnancy and lactation, and the maintenance of bone mineral in emergency situations by means of attenuation of the activity of osteoclasts . Further study has revealed that CT is produced extrathyroidally by NE cells throughout the body, and may have multiple functions [15,16]. CT is initially biosynthesized as a larger ProCT polypeptide which is subsequently cleaved enzymatically into its components, including the mature, active hormone (Fig 1). Interestingly, in humans with severe systemic inflammation, very high serum levels of ProCT and its component peptides are accompanied by normal or only slightly increased levels of mature CT . In order to investigate whether serum ProCT levels might correlate with the severity of illness in sepsis, and thus might provide a convenient marker, we employed a rodent model of quantifiable Escherichia coli peritonitis, modified for use in the hamster . This model was then utilized to determine the metabolic perturbations associated with the procalcitonin peptide levels observed with sepsis. The procalcitonin (ProCT) molecule and its components. AminoproCT= amino terminus of procalcitonin; immature CT = the 33 amino acid,non-amidated CT; CCP-I = calcitonin carboxyterminus peptide-I. In normalpeople, in addition to the free, active, mature CT, small amounts of ProCT,aminoproCT, CCP-I, the conjoined CT:CCP-I peptide, and the immature CTcirculate . The amino acid sequence of the ratmature CT is very similar to that of humans, and the sequence of hamster CT,although not yet known, reveals, by immunoassay studies, a marked homology withthe rat. Male Golden-Syrian hamsters weighing 80–140g (Harlan Animals, Indianapolis, Indiana, USA) were housed in a controlled environment and were exposed to 12 h light–dark cycles. The animals had unrestricted access to water and standard rodent chow throughout the experiments. This study was approved by the Institutional Animal Care and Use Committee at the Veterans Affairs Medical Center, Washington, DC. Escherichia coli (O18:K1:H7) were obtained from Dr Alan S Cross, Division of Communicable Diseases and Immunology, Walter Reed Army Institute of Research, Washington, DC, USA. The bacteria were grown in 100 ml of LB Broth (Fisher Scientific, Pittsburgh, Pennsylvania, USA) at 37°C in a shaker water bath to log phase and stored in 250 μ l aliquots at -70°C until use. On the day of an experiment, a 250 μ l aliquot of bacteria was thawed and grown in 100 ml LB broth at 37°C in a shaker water bath to log phase. The optical density of the specimen was measured at 600 nm on a Stasar III spectrophotometer (Gilford Instruments, Oberlin, Ohio, USA) and quantified by interpolation on a previously constructed curve of optical density plotted against colony forming units (cfu). Additional specimens were taken from the stock solution, and diluted and plated to confirm the counts estimated by spectrophotometry. Bacterial suspensions of 2.0 × 108, 1.0 × 109, 2.0 × 109, or 4.0 × 109 cfu/ml E coli were pipetted in 0.5 ml aliquots into 8 mm plastic embedding molds (Shandon-Upshaw, War-rington, Pennsylvania, USA). Each pellet for implantation was made by adding 0.5 ml sterile molten agar at 50°C to the bacterial suspension, after which the mixture was allowed to solidify at room temperature. The final number of viable colony forming units of bacteria in each pellet was 1.0 × 108, 5.0 × 108, 1.0 × 109, or 2.0 × 109 cfu/pellet. Individual hamsters were assigned to four groups (n = 16/group) to receive progressively increasing inocula of bacteria. Afteradequate anesthesia with 50 mg/kg pentobarbital via intraperitoneal injection,the abdomen of each animal was prepared with 70% alcohol and incised in themidline. Bacterial sepsis was induced by implanting one pellet in the rightlower quadrant of the peritoneal cavity of each animal. The abdominal incisionswere then closed with non-absorbable suture. Animals were caged individually,given unrestricted access to water and rodent chow and monitored for mortalityover a 72 h period. After intraperitoneal implantation of agar pellets withprogressively increasing doses of E coli, separate groups (n = 10/group) were killed for serum total immunoreactive (i)CT determinations.Since mortality was evident but not prohibitively high at 12 h, we chose thistimepoint to determine serum total iCT levels. Therefore, 12 h after animalswere challenged with E coli, they were anesthetized withintraperitoneal pentobarbital (50 mg/kg) and exsanguinated by open cardiacpuncture. The blood was collected in individual tubes and centrifuged at3000 rpm for 15 min. The serum specimens were transferred to individual glasstubes, sealed with parafilm and stored at -70°C untilradioimmunoassay. Serum was also obtained from a patient with documentedGram-negative sepsis and was stored at -70°C to be assayed with thehamster serum samples following G-75 Sephadex gel filtration for the purpose ofcomparison of molecular forms as described below. Male hamsters (n = 16/group) underwent intraperitonealimplantation of agar pellets impregnated with 2 × 109 cfuEcoli (O18: K1: H7), according to the above implantation protocol. Thishigh dose was chosen for its ability to induce a significant increase of ProCTat 12 h in the proceeding experiments. Animals were killed in the previouslydescribed fashion at 3, 6, 12 or 24 h after septic challenge. Their sera wereanalyzed for serum total iCT per the radioimmunoassay described below, as wellas for total serum total calcium and serum albumin using a standard serummultichannel analyzer. The samples were allowed to warm to room temperature and werepipetted into labeled glass test tubes in 1.0 ml aliquots, to which 100 μ ldextran blue (B-2000, 2 000 000 Da; Sigma Chemical Co, St Louis, Missouri, USA)was added. Five milliliter glass columns were rinsed with 1M ammoniumhydroxide:acetonitrile (1:1) and deionized water, after which fine-gradepolyacrylamide gel columns (5ml) were prepared (BioGel P-2; 100–200 mesh;Bio-Rad Laboratories, St Louis, Missouri, USA) using a glass bead to supportthe gel. The samples were applied to the columns and eluted with 0.1 M ammoniumbicarbonate containing 0.1% Triton X-100 (Pierce, Rockford, Illinois, USA). Thespecimens containing dextran blue were then recovered in their original testtubes, to which ethyl alcohol was added in a 2:1 volume ratio. These mixtureswere then centrifuged at 3000 rpm for 30 min, after which the supernatant foreach was decanted into new tubes and the pellet discarded. The solvent wasremoved using a Savant SpeedVac Plus (SC110A) over 2–4 h. The residue for eachsample was then reconstituted to the original specimen volume using gelatinbuffer (0.2% gelatin in borate buffer with 0.01% merthiolate and 0.1% TritonX-100). Using these techniques, peptide recovery is approximately 80%. The radioimmunoassay design was similar to that previouslyreported . Initially, hamster serum total iCT fromgel filtration studies was determined by using an antiserum to thecarboxyl-terminal portion of mature human CT, Ab4. This antiserum reacts withthe CT molecule, whether it is in the free, amidated, 32-amino acid matureform, or within its precursor propeptides [ie procalcitonin, the conjoinedcalcitonin:calcitonin carboxypeptide-I (CT:CCP-1), or the free immature,unamidated CT]. Subsequent studies were performed with a new antibody, R1B4,which has ten times the crossreactivity of Ab-4 with the prohormone. The bufferwas 0.2% gelatin (0.13 M H3BO3 containing 9 g NaCl, 2 ggelatin, 1 ml Triton-X 100 and 0.1 g merthiolate/l at pH = 7.5). The antiserum waspreincubated with standards or unknowns (20–100 μ l) in 0.2 ml at 4°Cfor 4 days. After addition of 50 μ l 125I-hCT, and 200 μ l gelatinbuffer, incubation was continued for 2 days. After adding 50 μ l goatanti-rabbit IgG bound to iron particles, incubation was continued in 0.5 ml for1 day. Bound and free hormone were separated with magnetic tube racks. Maximumbound =37%; sensitivity =1g; 50% B/Bo =50pg. Similarly to work previously reported ,constituted extracts, in 1–10 ml 0.2% gelatin or 0.2% HSA, were applied tocalibrated 2.5 × 100 cm columns containing G-75 superfine Sephadex(Pharmacia Biotech, Piscataway, New Jersey, USA) suspended in 0.1% human serumalbumin (1 g HSA, 0.1 mol NH4HCO3 and 0.1 g merthiolate/l atpH = 7.5) at 4°C. One hundred fractions (120 drops or 5.5 ml/tube) werecollected during 48 h in 16× 100 mm borosilicate glass culture tubes. Thevoid volume (VV) was based on the peak elution volume (EV) of blue dextran, andthe salt volume (SV) was based on the peak EV of Na125I. The Kav forindividual components was determined according to the formula: Kav =(EV–VV)/(SV–VV). The mortality rates at 72 h for animals receiving progressively increasing doses of bacteria (n = 16/group) were 0, 20, 70, and 100%, respectively. Differences in mortality between all groups, including control animals (n = 17), were significant by Chi-square (P = 0.001). 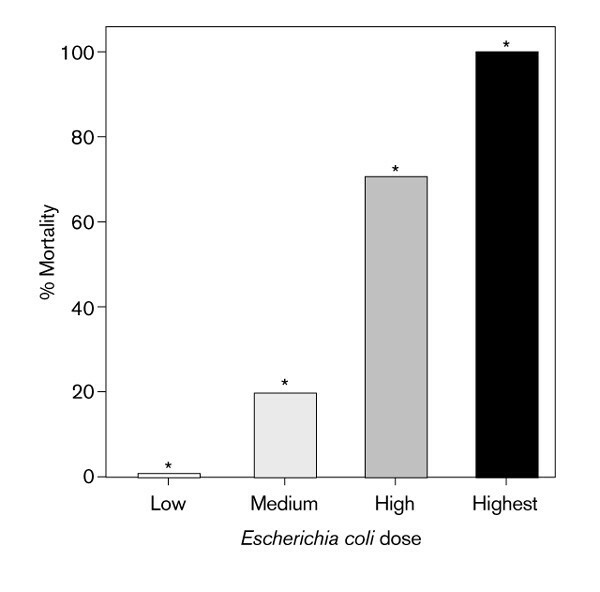 Furthermore, these values represent a direct relationship between the size of the inoculum of E coli and mortality (Fig 2). Hamsters which were subjected to these graded doses of sepsis (n = 10/group) had serum total iCT levels at 12 h (mean ± SEM) of 250 ± 90, 380 ± 60, 1960 ± 490, and 4020 ± 510 pg/ml, respectively. Control animals (n =17) had serum total iCT levels of 21± 2 pg/ml. All groups were statistically distinct, except between 0 and 20% mortality (P = 0.001, Kruskal-Wallis one-way ANOVA; Fig 3). The molecular species of the total serum iCT in the serum was determined by radioimmunoassay of fractions obtained from Sephadex gel filtration of pooled hamster sera as described above. The molecular mass of the predominant species of iCT measured (ie > 90%) was approximately 14 000 Da. From previous data , it is known that this fraction corresponds to ProCT, which in humans is 12795 Da. As shown in Fig 4, this molecular fraction in the hamster co-elutes with the ProCT fraction in the serum of a septic patient . 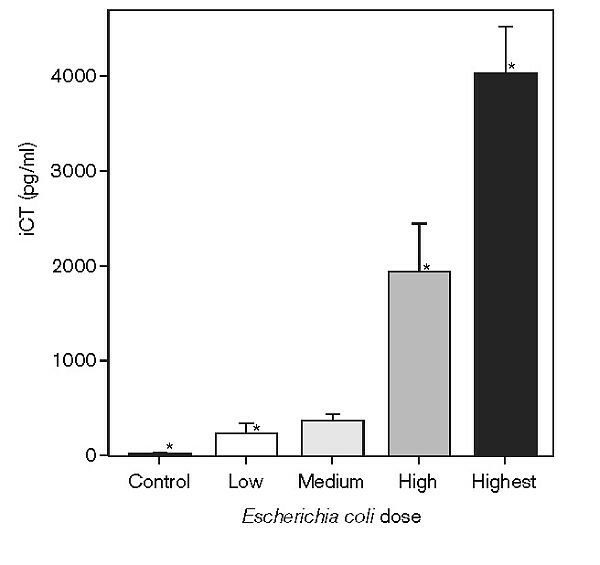 Serum total iCT levels among groups exposed to a high dose of E coli (n = 13–15) and killed at 3, 6, 12 and 24 h increased from a baseline of 21 ± 2 pg/ml (mean ± SEM) to 78 ± 3, 542 ± 100, 3570 ± 920, and 4240 ± 1080 pg/ml, respectively. The changes in serum total iCT at all time points, except between 12 and 24 h, were statistically significant (one-way ANOVA, P = 0.001). Total serum calcium levels at these timepoints were 11.6 ± 0.1, 12.1 ± 0.2, 9.4 ± 0.2, and 10.6 ± 0.4 mg/dl. The decrease at 12 h was statistically significant per MannWhitney rank sum test (P < 0.05). Simple linear regression reveals an inverse correlation between total calcium levels and total iCT (r = -0.81). Serum albumin levels varied minimally at 3, 6, 12 and 24 h from a baseline of 3.3 ± 0.1 g/dl, and therefore did not account for the decrease in measured calcium. Relationship between inoculum of Escherichia coli andmortality. Low dose = 1.0 × 108 cfu/pellet, medium dose = 5.0× 108 cfu/pellet, high dose = 1.0 × 109cfu/pellet, and highest dose = 2.0 × 109 cfu/pellet.Mortality for low dose was 0%. *Significantly different from othergroups per Chi-square analysis, P < 0.001. Relationship between inoculum of Escherichia coli andtotal immunoreactive calcitonin (iCT). Low dose = 1.0 × 108cfu/pellet, medium dose = 5.0 × 108 cfu/pellet, high dose = 1.0× 109 cfu/pellet, and highest dose = 2.0 × 109cfu/pellet. *Statistically distinct, except between low and mediumdoses, per one-way ANOVA, P = 0.001. 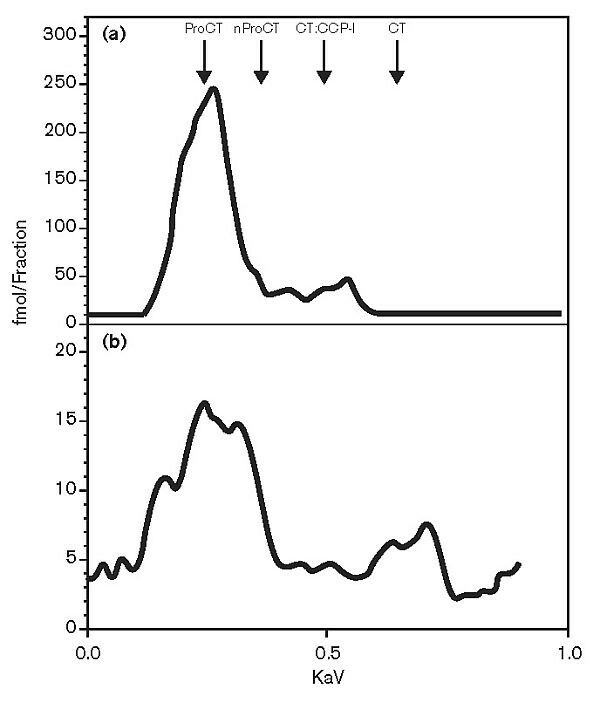 Comparison of chromatographs from septic human serum (a) and pooled septic hamster serum (b). The dominant peak in each graphhas an estimated elution position of 0.2 KaV, which corresponds to the elutionposition of human procalcitonin (ProCT) . CT,calcitonin; CT:CCP-1, conjoined calcitonin:calcitonin carboxypeptide-I. The characteristics of the inflammatory response in sepsis suggest that successful treatment requires a clinically useful marker which can indicate the severity of illness and which is expressed early enough in the sepsis cascade to allow therapeutic interventions to be initiated in a timely manner . Additionally, insights into the biosynthesis, regulation, and physiologic activity of such a marker may illuminate some of the causative factors in the pathophysiologic and clinical events of the sepsis syndrome. Furthermore, the marker itself may prove to be a therapeutic target. Serum levels of ProCT as well as its component peptides are massively elevated in burns , heat stroke , systemic infections , and other inflammatory states [12,22]. Using an antiserum to CT which recognizes the free mature CT, the immature CT within the ProCT molecule, and the conjoined CT:CCP-1 peptide, we have demonstrated that levels of serum total iCT are also elevated in the septic hamster. Then, utilizing gel filtration techniques, we showed that much of this iCT was in the form of ProCT; this is similar to the human subject with sepsis [17,23]. Our findings indicate a positive correlation between ProCT component peptides and the degree of sepsis. In this model, the series of metabolic experiments furthermore reveal that ProCT is temporally associated with and inversely correlated with serum total calcium levels. CT is a single chain, 32-amino acid peptide that originates from the CALC-I gene on chromosome 11 . In humans the highest concentration of tissue iCT is in the parafollicular cells of the thyroid gland. However, iCT can be detected throughout the body in NE cells of various tissues. Indeed, in humans the lungs contain more total iCT than does the thyroid gland . While mature CT has diverse effects on various target tissues, its overall physiologic significance in normal individuals is not well understood. In health, its principal role is to protect against excessive bone turnover during times of increased need by attenuating the activity of osteoclasts . CT and its precursors, however, may exert other effects in health or in disease . The polypeptide precursor of CT, pre-procalcitonin, undergoes cleavage of its leader sequence early in posttranslational processing to yield ProCT, and several constituent peptides (Fig 1). In normal, regulated secretion, ProCT is trafficked through the Golgi apparatus and then packaged into dense-core secretory vesicles [26,27]. Proteolytic processing within the trans-Golgi and the secretory vesicles culminates in the formation of the active, mature secretory product, CT, which is released by exocytosis at the apical surface of the NE cell. In the absence of an appropriate signal at the plasma membrane, these vesicles serve as storage repositories for mature CT. In severe systemic inflammation in humans, however, enormous levels of ProCT and other component peptides appear in the serum, while mature serum CT remains normal or only minimally elevated . The cellular source of this increase in serum levels, and the reasons that ProCT and its component peptides are not processed to the mature hormone, are unknown. In inflammatory states, ProCT and its related peptides appear to be secreted by a continuous bulk-flow constitutive pathway, in which only limited conversion to mature CT occurs . One might postulate that severe inflammation causes such a profound hypersynthesis of the prohormone that the NE endoproteolytic machinery is overwhelmed. This may result in a marked shift to the constitutive pathway of secretion, resulting in an incomplete processing of precursors. In this respect, a shift to constitutive secretion has been reported to occur by the experimental induction of dysfunctional prohormone convertase enzymes or by injury to the plasma membrane . Perhaps some cytokines may induce constitutive secretion by such a process [30,31]. It is also possible that ProCT and its component peptides are released by non-NE cells, which normally possess regulatory mechanisms limiting the expression of ProCT mRNA; these inhibitory mechanisms may be deregulated by unusually high levels of inflammatory mediators. Stimulation of synthesis in such non-NE cells would result in a preferential production of ProCT because these cells lack the enzymes for complete prohormonal processing. It is unknown what impact, if any, this increase of ProCT and related peptides has on patients. Hypocalcemia is a common finding in critically ill and especially septic patients. Indeed, the development of hypocalcemia in the critically ill has been shown to be associated with a poor prognosis [32,33]. ProCT contains within its structure the immature CT molecule; therefore, very high and sustained levels of ProCT might mimic one of the pharmaco/physiologic activities of CT, which is the lowering of serum calcium levels. In our experiments we noted that total iCT levels peaked at 12h following the septic insult. This was concurrent with a significant decrease in serum total calcium. Nevertheless, this association does not prove a causal relationship between elevated ProCT levels and hypocalcemia. Also, the relationship with ionized calcium was not determined in this study. The early and marked hypersecretion of ProCT and its component peptides in inflammatory states makes them promising serum markers for the sepsis syndrome. These peptides are released into the central circulation and may act systemically, as opposed to many of the known mediators of sepsis, which are released locally and often act in an autocrine or paracrine fashion. An important feature of ProCT and some of its component peptides are their long half-lives, which contribute to their potential usefulness as serum markers. Indeed, elevated levels of ProCT peptides have been found to persist at least 24 h following an appropriate stimulus, in contradistinction to other markers, such as tumor necrosis fctor-α, whose levels may be only transiently elevated after an inflammatory challenge [34,35]. Thus, they provide a long-lasting target to evaluate the effects of immunoneutralization. Accordingly, we recently reported that ProCT markedly contributes to mortality in experimental sepsis, and that immunoneutralization of this molecule diminishes mortality in our model of hamster sepsis . In summary, our animal experiments demonstrate an association between levels of serum ProCT and its component peptides with the degree of sepsis, reinforcing clinical findings that these peptides are useful markers for this condition, and may predict mortality. Further experiments to examine the cellular source, pathophysiology and metabolic activity of ProCT and its component peptides are warranted. Such studies may determine the role of these hormonal peptides in inflammation and sepsis.